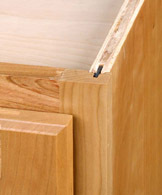 Our most popular line of component cabinetry features plywood construction and durable prefinished interiors. Solid wood shelving and two drawer box construction options add value, while a host of available options add to the line’s appeal; including 11/16” flush sides and matching specie interiors. 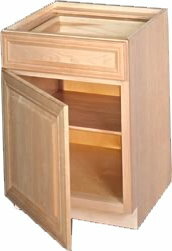 Most vanity cabinets are available in 18” or 21” deep and 31-1/2” or 34-1/2” high in over 150 skus. Appliance Cabinetry is available to accommodate most manufacturers’ appliances. Home office desk and bookcase units are available in five standard wood species. Blumotion soft close slides - the best in the industry.